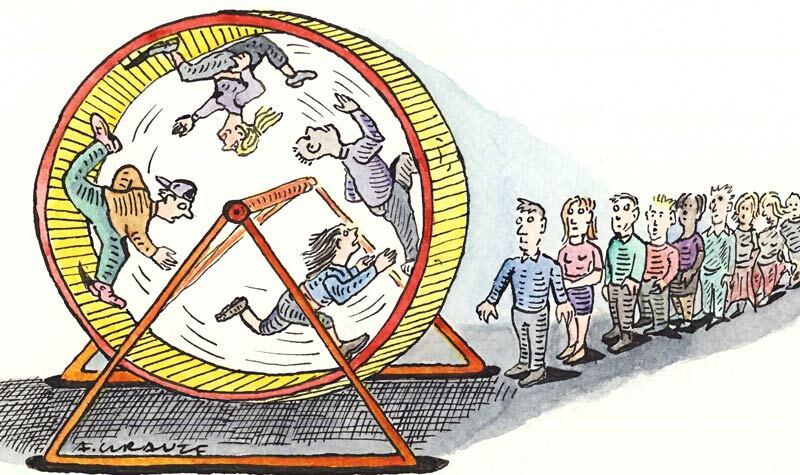 Do you ever feel like you’re running in circles on the “hamster wheel” of life? For many of us, it’s easy to fall into the habit of doing the same thing over and over, even though our actions aren’t producing the results we want. It can be difficult to break out of our normal routines and patterns of thinking. Why do we persist on the same path and expect different results? My theory is that we prefer to stick with what’s comfortable and familiar, so that we can avoid the anxiety of making a change. We subconsciously value our comfort more than getting what we want. Thus, we soldier on, each time crossing our fingers, and hoping for a better outcome. A much more effective strategy, however, is to routinely evaluate what is working in your life and what isn’t. While I know that some of you (myself included) might get heart palpitations at the thought of this, the truth is that you can’t rationalize your way to a productive life. If you really want to achieve your goals, it’s often necessary to move out of your comfort zone and open up to new and better options. We sometimes need a compelling reason to motivate us to make a change. In some cases, we wait until a situation becomes so uncomfortable that we have no choice but to seek new ways of helping ourselves. But why wait for the pain? Wouldn’t it be much better to be motivated by a positive goal, rather than by the fear of pending disaster? What do I want from my life? Am I clear on my goals? Are my current actions getting me closer to my goals? If not, what other actions can I take? If I’m resistant to other actions, what am I afraid of? What is holding me back? Are my fears justified? What is the worst that can happen? What is the best that can happen? What steps can I take to reduce my anxiety and make the change easier for me to accept? Although it’s always simpler to stick with what you know, try challenging yourself to think “out of the box” as you consider other options. To get the results you want, you sometimes need to follow your intuition and open yourself up to new possibilities. As a highly sensitive person, you are blessed with deep-thinking and reflective capabilities that can propel you to find creative solutions to challenging problems. Although change can be daunting to the highly sensitive psyche, the rewards are well worth it, and the more you step up to the challenge, the easier the process becomes. Why not give it a try? Let today be the day that you alter your course and live your most productive life! I’m interested in any thoughts or comments that you have. Are you tired of spinning your wheels? If so, why do you think you feel stuck? Is there a pattern of roadblocks that you face again and again? If your fears hold you back, do you ever challenge these fears to see if they are justified?